Vice President Pence arrives to speak at an event in the Rose Garden of the White House on May 3, 2018. (Washington Post photo by Jabin Botsford). The creation of a new branch of the military - the first since 1947 - could require a significant reorganization of the Pentagon. And some officials within the military and national security communities fiercely oppose the idea. 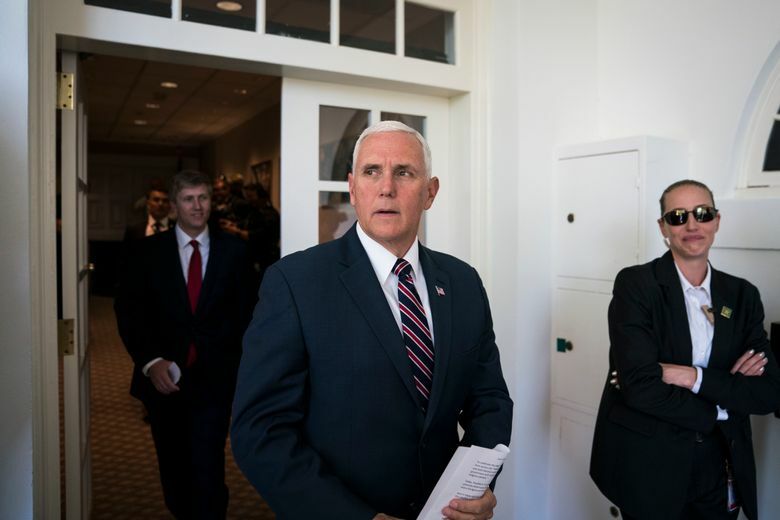 WASHINGTON – Vice President Mike Pence laid out an ambitious plan Thursday that would begin creating a military command dedicated to space and establish a “Space Force” as the sixth branch of the U.S. military as soon as 2020, the first since the Air Force was formed shortly after World War II. Pence warned of the advancements that potential adversaries were making and issued what amounted to a call to arms to preserve the military’s dominance in space. But the monumental task of standing up a new military department, which would require approval by a Congress that shelved the idea last year, may require significant new spending and a reorganization of the largest bureaucracy in the world. And the idea has already run into fierce opposition inside and outside the Pentagon, particularly from the Air Force, which could lose some of its responsibilities. This week, Mattis said the Pentagon and the White House “are in complete alignment” on the need to view space as a warfighting domain. But he stopped short of endorsing a full-fledged Space Force. In a briefing with reporters after Pence’s speech, Deputy Defense Secretary Patrick Shanahan suggested that Mattis’ comments opposing the Space Force were made at a different time, before the Pentagon received a bolstered budget. White House officials have been working with national security leaders to aggressively move ahead without Congress. The first step is creating a new U.S. Space Command by the end of the year, which would be led by a four-star general, the way the Pentagon’s Indo-Pacific Command oversees those regions. The new command would pull space experts from across the armed services, and there would be a separate acquisitions office, dedicated to buying satellites and developing new technology to help the military win wars in space. For months, Trump has been calling for a Space Force, a new, free-standing military department, with its own chain of command and uniforms. In a letter to supporters Thursday, the Trump 2020 campaign said it would sell a line of gear that could come with a logo of their choosing – including one labeled “Mars Awaits” – to commemorate “President Trump’s new Space Force,” according to a copy of the email – a move that fueled criticism that the effort was motivated by politics. The White House intends to work with lawmakers to introduce legislation by early next year, a senior administration official said, with the hopes of standing up the first new military department since the Air Force was formed in 1947. Some members of Congress and military leaders have been warning that space is no longer a peaceful sanctuary, but a domain of conflict that needs more attention and resources. Space is vital to the way the United States wages war; the Pentagon’s satellites are used for missile-defense warnings, guiding precision munitions, and providing communications and reconnaissance. Russia and China have made significant advancements, challenging the United States’ assets in space. In 2007, China blew up a dead weather satellite with a missile, creating a massive debris cloud in orbit, which Pence called “a highly provocative demonstration of China’s growing capability to militarize space.” China also has demonstrated the ability to hit satellites in a much deeper orbit where the military parks some of its most sensitive assets. The official must sort out many details, including how the Pentagon would recruit for the Space Force and compete for resources within the Pentagon. Even basic details, such as what uniforms and what rank structure the Space Force would use, must be decided. Some members of Congress advocated last year for creating a Space Corps in the Air Force Department, similar to how the Marine Corps is part of the Navy Department. Elevating the proposal to create a new department will mean additional Pentagon bureaucracy, critics say. Efforts to reach several senior Air Force officials were not successful Thursday. Wilson was traveling on business and not at the Pentagon when Pence made his announcement. Gen. David Goldfein, the Air Force’s top officer, and Gen. Stephen Wilson, the vice chief, sat quietly in the Pentagon auditorium as Pence spoke. Air Force Gen. Paul Selva, the Pentagon’s vice chairman of the Joint Chiefs of Staff, said in a briefing with reporters that the Pentagon is very much in favor of establishing a Space Command as a way to speed up efforts in space. But when it comes to establishing a new branch of the military, Selva said, “there’s an obligation” to present a set of options that can be presented to Congress. “He’s the commander in chief,” Selva said of the president. The White House has pushed for Congress to invest an additional $8 billion in national security space systems over the next five years. “We have been warning for years of the need to protect our space assets and to develop more capable space systems,” they said in a joint statement. In his speech, Pence urged the audience to support the administration’s effort to create the department. “The only thing we can’t afford is inaction,” he said.